So, what does Jezebel have to do with racing? Now here is how it all started. Scott has owned many other classic Chevrolets: a ’72 Chevelle, three 1965 Nova’s, a ’70 Vega, a ’69/’70 Nova, and even another ‘55 Bel Air before this one. While Scott is no stranger to owning a Chevrolet muscle car, it was owing a ‘55 Bel Air that was a childhood dream. Many are immediately drawn to the classic lines of the ’55 Chevrolet Bel Air. Scott tells us Jezebel drives as straight as it looks on the street and at the track. No corners were cut with this build, including the custom-built headers and down-pipe fabricated by Dow Brothers Race Cars. Scott installed a 20-pound halon fire system and dual parachutes out back. Stopping this 3,200-plus-pound behemoth isn’t easy! Topping off the appearance is a set of Weld V series wheels wrapped in Mickey Thompson tires. That would be the first of many trips for the old Bel Air, as it saw some street action on a weekly basis. Milk crate and all, that was the car that got Scott hooked on the ’55s. After years of searching, and decades of waiting, mid-way through 2016 Jezebel was found, purchased, and hauled down to Northern California. Once the ’55 arrived in California, the long nights of work began to make the car what she is today. Scott’s ’55 is certified to 6.0 while still utilizing an all-steel body, minus the hood and deck lid. Nonetheless, it’s registered and insured with all functioning street equipment, just the way he wanted it. Since the purchase in 2016, Jezebel has had several nitrous engine combinations, beginning with a big-inch, nitrous-assisted engine require a lot of time and maintenance after each pass. That led to today’s configuration. Scott regularly enters big-tire grudge races throughout the West coast. Scott mentions his goals are to keep improving his elapsed times and get a little bit quicker on each run. 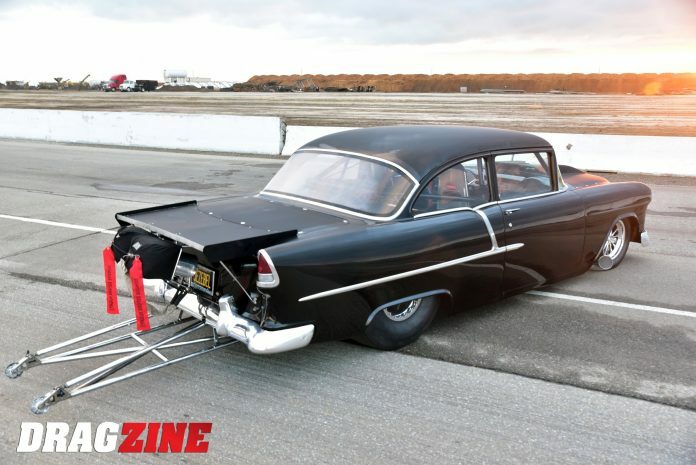 “I try to only compete with myself because there’s always going to be someone that’s faster and willing to spend more money than me.” Scott has already made great strides with the ’55 — Jezebel has seen sub 4.30 E.T.s in the 1/8-mile at over 170 miles per hour. “It started to become more work than fun. I wasn’t enjoying the car as much as I was hoping to,” Scott explains. As a business owner and grudge racer, he wanted something with a little less maintenance but more tunable power. For the 2018 season, he installed a fresh F-1X ProCharger with a 540 cubic-inch crate motor from Scoggin Dickey Performance Center. Scott choose the steel block version loaded up with Diamond pistons, GRP aluminum rods, Callies Magnum crank. T&D shaft rockers, a COMP camshaft, and Brodix aluminum cylinder heads. For induction, it utilizes an Edlebrock intake with an APD blow-through alcohol carburetor and an MSD ignition system. This combination has been tuned by both Scott and Theo Deck of Wizard Racing and has seen north of the 2,500 horsepower range. Harnessed to the engine is a Lenco three-speed transmission with Bruno-drive and FTI torque converter. With a car as heavy as the ’55 Bel Air, Scott needed some pretty stout drivetrain components in order to handle the amount of power the blown 540 was putting out. Mating the transmission to the Fab-9 rear end is a custom chromoly driveshaft. The rearend is housed with Strange 40-spline, gun-drilled axles and 4.10 gears. Rounding out the suspension are Strange front springs/struts with Santhuffs out back. When you’re trucking over 170 miles per hour in the 1/8-mile at over 3,2oo pounds, good stopping power is a must. Along with the dual parachutes, Scott installed a set of brand new Strange Pro Series brakes. Despite the carbon fiber transmission tunnel cover and a few other upgrades, this 55 mostly appears as it originally did from the factory: this includes the factory dash, door panels, headliner and carpet. You can catch Scott and Jezebel running big-tire grudge and no-time races throughout the West coast.